Bringing children to Walt Disney World is a wonderful and magical experience. Before leaving for your trip, it helps to prepare, be flexible, and know that at the end of each vacation day at Disney with the kids, you and your little ones have a comfortable Orlando vacation rental home with private pool to return to. Having grown up in the Orlando area, I have enjoyed my time at Walt Disney World since before I could speak. I grew up loving the Disney magic that I felt as soon as I crossed past the ticket gates. As a youngster, one of the things I looked most forward to when having my own children was sharing the Disney magic with them, and as I planned my first trip as a mommy with our six-month old daughter, I soon realized how different it would be traveling with children. The Disney experience can be trying and frustrating if you are taking youngsters because it is so different than traveling as an adult without children. 5 Tips for Moms Vacationing at Orlando’s Walt Disney World. There are many things you use each day that are common sense to pack; stroller, diaper bag, extra outfits. However, I found it was the unordinary things that were most helpful. Bringing a beach towel to each park can serve multiple purposes such as covering the stroller for nap time to lessen distractions, providing a soft spot to get out of the carriage and stretch their little legs, and a cozy way to dry off if they venture into any of the water features the parks have. Also, we don’t travel without a nightlight and outlet covers. These are things we use at home all the time and the one time we forgot to bring them, it was not pleasant. A baby monitor is great when you are staying in one of our Vacation Homes so you can enjoy your private pool and lanai while the little one’s sleep. Another item we always travel with are sippee cup leashes. We use them for everything from Sippee cups to Souvenirs. Anything your toddler may want to keep in the stroller that you don’t want them to toss works great with these. We travel with 2-3. Driving and flying can both be stressful on parents and little ones. The best way to avoid meltdowns and frustration is to be prepared. When we fly to Disney, we make sure to schedule the flight during a nap time. We tire the kids out by walking around the terminal and once we board, the sound and vibration of the plane usually creates a great sleeping environment. When we drive, we utilize naps and bedtime as best as we can as well. We bring a travel potty for emergencies, lots of wipes, a bag for garbage, and travel trays for them to play and eat on. Whether we fly or drive, we pack some key items to keep them entertained. We have a portable DVD player and DVD’s, coloring books as well as triangle Crayons (they are 3 sided instead of round so they won’t roll away from your little ones), and snacks, snacks, snacks! All four of the Walt Disney World theme parks have great experiences and attractions for the smallest Mouseketeer. I recommend getting to the parks as early as possible. Odds are, your little one is up early anyway, you might as well get to the parks at opening and tour as much as possible while the lines are short. Little ones do not wait in line well! See and experience as much as you can before early afternoon. Once it starts to heat up and get more crowded, I recommend heading back to your home, cooling off and resting. It gives little ones (and big ones!) a chance to cool off and recharge. Then you can head back to the park later in the day ready for the evening. My little ones love the rides but often, a lot of the other experiences that are best for them are overlooked because they are not rides. Here are some recommendations for fun experiences that allow your little ones to stretch their legs. Our beautiful and well equipped Orlando vacation rental homes are an excellent option when traveling to the area surrounding Walt Disney World. I find that vacation homes are more convenient and much more relaxing than cramped hotels. 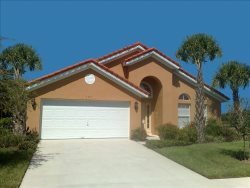 Many affordable and comfortable Orlando vacation rental homes include a private pool for $125 - $170 per night. These 3 and 4 bedroom private pool homes have a washer and dryer which is so important when you have young children. Having your own full kitchen at your disposal cuts down on food cost and makes meals easy and convenient. With enough space for everyone to have their own rooms, there is no worry of younger children waking up anyone in the wee hours of the morning. Also, we find that when we stayed in hotels, once it was bedtime for the kids, it was bedtime for the adults. With your own vacation home, we put the kids to bed and then are free to relax in the private pool, head to the game room for some friendly competition, or lounge in the living area and watch TV. Also, several of our vacation homes offer children’s equipment so that you don’t have to travel with your own.